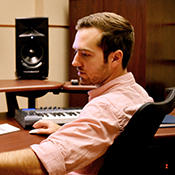 Ryan Swift Joyner is Assistant Professor of Sound Design at Baylor University. He teaches courses focusing on the artistic and technical endeavors that affect everything a theatre audience experiences aurally. Ryan obtained his Master of Fine Arts in Lighting and Sound Design from California State University Fullerton as well as a Bachelor of Fine Arts degree from Baylor. As an alumnus of the department he now teaches within, he strives to empower current students with the most current knowledge and skills used in the industry while continuing the legacy of a positive collaborative atmosphere that makes Baylor Theatre unique. Ryan is an active professional theatre designer providing designs in sound and projection design both domestically and internationally. Through his research into immersive theatre technology, Ryan explores the intersection of Virtual and Augmented Reality with live performance.